CNN anchor Soledad O’Brien disavowed any knowledge of a bias on her network against Republican vice-presidential candidate Sarah Palin, particularly concerning the issue of her five children, during a segment on Wednesday’s Newsroom program. She moderated a segment with two bloggers, a conservative and a liberal, both of them mothers. When the conservative, Rachel Campos-Duffy of "The Real World: San Francisco" fame, stated how "journalists even on this network say things like, you know, can she really -- is she up to be vice president because she has five kids," O’Brien replied, "I have not heard one journalist who works for CNN, if that's what you're talking about, say that at all. We've interviewed people who said that and ask some similar questions about, isn't that sexist? So I'm not sure exactly who you're referring to." Well, let’s refresh Ms. O’Brien’s memory. As John McCain was getting to announce his choice of Sarah Palin on Friday, her colleague John Roberts asked correspondent Dana Bash about Palin’s youngest son and how he might be neglected if the governor became vice president: "There's also this issue that on April 18th, she gave birth to a baby with Down's Syndrome.... Children with Down's syndrome require an awful lot of attention. The role of Vice President, it seems to me, would take up an awful lot of her time, and it raises the issue of how much time will she have to dedicate to her newborn child?" Campos-Duffy and her counterpart, liberal blogger Erin Kotecki Vest, debated the issue of how sexism has crept into the discussion and news coverage surrounding Palin. As the two disagreed on the extent of sexism, O’Brien asked Campos-Duffy about Palin’s experience: "...[D]iscussing someone's fitness for office -- we're going to have to assume for either vice presidential pick that they potentially could wake up one morning and guess what, you're now the president, because something terrible happened to the guy who was president -- is discussing someone's experience. Why is that considered sexist and off-bounds?" When Campos-Duffy insisted that Palin did have experience, O’Brien countered, "With all due respect, Rachel, everyone says, you know, she's got experience on a lot of issues, you know, governmental executive, and then it kind of stops. I mean, Alaska has 670,000 people and a $6 billion budget, which is small. You know, Governor Bush, which he was governor before he became president, that was 24 million people, right? I mean, in all fairness." Campos-Duffy countered by bringing up Obama’s short list of experience, but O’Brien brushed that argument aside: "Yeah, but that's another argument. I'm talking about your candidate. Let's talk about your candidate, the V.P." After the conservative mother and blogger explained Palin’s experience, Vest chimed in and brought up her concerns about the Alaska governor’s knowledge of foreign affairs. Campos-Duffy replied to this by stating how she thought there was a double standard with Palin: "I think that the sexism comes because she's not being held -- she's being held to a higher standard because she's a mom than I think she would be otherwise." O’Brien asked her what she meant by that, and when Campos-Duffy brought up "journalists even on this network," O’Brien issued her denial. RACHEL CAMPOS-DUFFY: ...I think that the sexism comes because she's not being held -- she's being held to a higher standard because she's a mom than I think she would be otherwise. 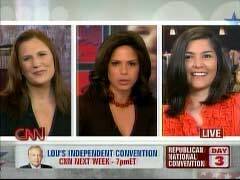 SOLEDAD O'BRIEN: So, okay. Let me get you to clarify. Why is that a higher standard? I mean, how is that a higher standard? O'BRIEN: I have not heard one -- I have not heard one journalist who works for CNN, if that's what you're talking about, say that at all. We've interviewed people who said that and ask some similar questions about, isn't that sexist? So I'm not sure exactly who you're referring to. CAMPOS-DUFFY: Well, they're asking the question -- they’re asking the question. Again, I've never heard senators or congressmen with lots of kids being asked that sort of question. I think it's something that's reserved for mothers.